The first room in the museum is developed around the figure of the pharaoh and the royal family. It has various royal representations, a number of majestic ushabtis and several pieces with the names of regions. The Egyptian state, which sprang up along the banks of the Nile, was governed and led by individuals with great power: the pharaohs. The pharaoh was at the top of the social order: being of divine blood, he was the highest priest who had to build temples and ensure the continued worship of the gods, the commander-in-chief of the Egyptian army, the highest judge, etc. In short, he was the guarantor of the cosmic order that ensured that the universe functioned in the correct manner. The pharaoh had certain attributes that were characteristic of his position and role. The most notable of these included the pschent crown, an emblem of the union of the two kingdoms into which Egypt was divided, and the cobra (ureu), the protector of royalty. Even to write his name a special protocol was used, made up of five elements at the pinnacle, with specific symbols such as the serekh, or cartridge. Of the more than 300 pharaohs recorded, there were those about whom little is known other than their name. Donated stele. Limestone. The Ptolemaic Period, the reign of Cleopatra VII (51-30 B.C.). The queen and king made offerings to the divinities Heqa and Sacmis. Based on the study carried out by Dr. Jean Yoyotte, the queen has been identified as Cleopatra VII and the king as Ptolemy XIII or Ptolemy XIV. 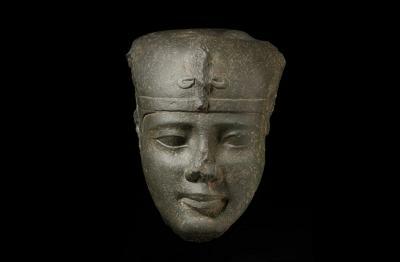 Head of statue of the pharaoh Nectaneb I. Wacke. 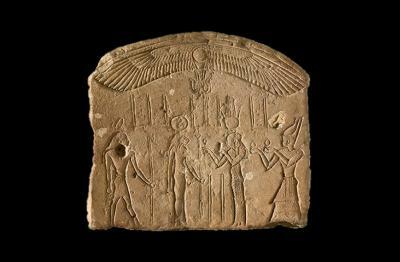 The 30th Dynasty, reign of Nectaneb I (380-362 B.C.). Nectaneb I was the founder of the 30th Dynasty, the last “native” dynasty of Egypt. Egypt would not experience independence under indigenous leaders again until the 20th century. The identification with Nectaneb is based on the comparison with statues that bear the name of this pharaoh. Ushabti of Taharqa. Granite. The 35th Dynasty, reign of Taharqa (690-664 B.C.). Taharqa was the most important of the “black pharaohs”. His ushabtis, which have been found in the necropolis of Nuri, reveal a special version of chapter VI of the Book of the Dead. Statue of the pharaoh Rameses III. Granite. Reign of Rameses III (1194-1163 B.C.). Rameses III is considered the last great pharaoh of the New Kingdom. Early in his reign, he led victorious military campaigns against the Libyans and the fearsome Sea Peoples. Later, the internal situation in Egypt would deteriorate as shown in the strike by workers at Deir el-Medina and the famous Harem Conspiracy, which ended the life of the monarch. 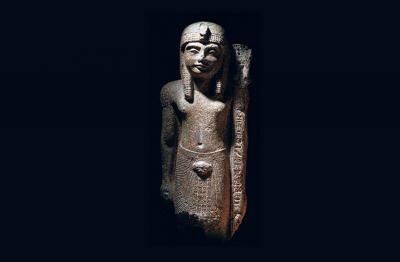 Rameses III hung a divine standard on this beautiful statue, which could have been completed with the ram Amon. Hieroglyphic texts show the different names of the king. 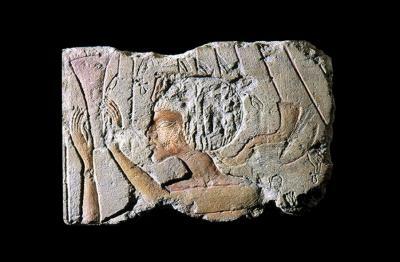 Wall relief with king Akhenaton making floral offerings to Aton. Sandstone. The 18th Dynasty, reign of Akhenaton (1353-1335 B.C.). 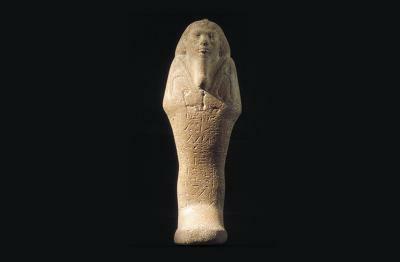 Akhenaton was the main protagonist of the most suggestive period in the history of Egypt: the Amarna Period. Considered a revolutionary period, the arts, religion and, above all, politics were affected by changes that were as profound as they were ephemeral.